We saw our first vine driving up the valley of the Blaise, following the iron industry heritage route from Saint-Dizier; the heritage centre was basking in the autumn sun, closed of course, with a lazy stream lapping round the building and an elderly vine propped up at its door. Still, we wouldn't be leaving the country without having seen a single vine. Then, at dinner in Bourbonne-les-Bains, we were served a local wine, a vin de pays des Côteaux de Coiffy - not a wine we'd ever heard of, but we enjoyed it, and decided that before we left the area we'd see if we could track down where it came from. The vines on the roundabout as we left town assured us we were on the right road, and it wasn't far to Coiffy le Haut, where a large sign told us we had arrived. We were warmly welcomed at the Caves de Coiffy, especially when we said that we had enjoyed their wine at dinner last night - oh, where had we eaten? oh, yes, they're good, and they try to use local produce. In that case, we must have had this wine, this is the one they stock. What would we like to try? And were we sure we wouldn't like to try this, too, and maybe this... The Caves are a family operation: Madame (Florence Pelletier) is the oenologist - and also designs the distinctively curved bottles, and the labels, with their handwritten descriptions and shield shape (this is a piece of cheek, apparently, since it's a shape associated with champagne, and a declaration that although they are outside the Champagne appellaation, they still win prizes for their sparkling wines); Monsieur, whom we met, is, if I have this right, president of the Confrérie des Vins de Coiffy - the association whose purpose is to promote the local wine, and clearly promotion is something he does with great enthusiasm and without taking himself too seriously (there's a picture of him on this page, together with more confréries, each with its own exotic costume, than I could ever have imagined). We must have been there for an hour, tasting a little of this and a little of that, while people dashed in to buy a bottle or two, or to deliver a lunch invitation. We bought a couple of bottles of rosé (Monsieur was rather dismissive of this: to paraphrase "why does everyone make such a fuss about the rosé? the ladies, especially, they won't try my beautiful wines but they get excited about the rosé." No doubt. But once in a while, rosé is what I want) one of each of the sparkling wines and half a dozen of the pinot noir. We tried the pinot on desperance, who was diplomatic: "I drink a lot of big fruity shiraz. This is about as unlike a big fruity shiraz as you can get, and still be wine." It is, too - that's what I like about it, that it offers a choice. Anyway, D. also tried it and pronounced it acceptable, so that's all right. 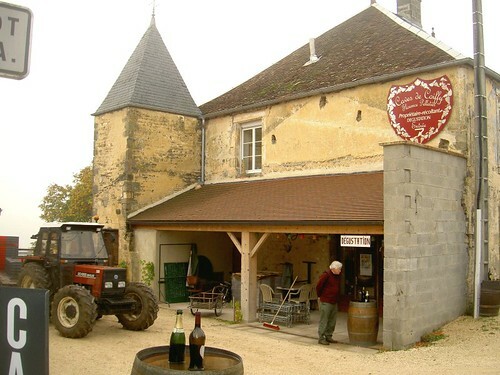 When we had made our purchases we left, driving down from Coiffy le Haut at the top of the hill through the vines - at last - which cover the steep slope down to Coiffy le Bas. One little triangle of vines was surrounded by parked cars, and filled with people gathering grapes on this last day of the harvest. And that was our farewell to the vines. I didn't take it as disparaging; you said it very carefully, and it struck me as a very good way of describing the wine.